Saint Anthimus of Iberia was one of the most highly educated people of his time. He was fluent in many languages, including Greek, Romanian, Old Slavonic, Arabic, and Turkish and well-versed in theology, literature, and the natural sciences. He was unusually gifted in the fine arts—in painting, engraving, and sculpture in particular. He was famed for his beautiful calligraphy. 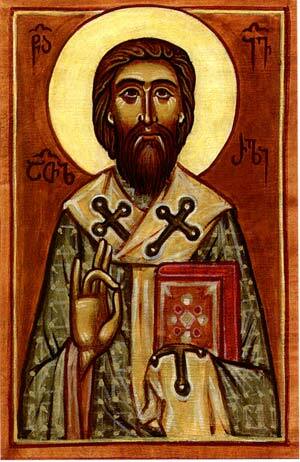 Finally, St. Anthimus was a great writer, a renowned orator, and a reformer of the written Romanian language. Little is known about the youth of St. Anthimus. He was a native of the Samtskhe region in southern Georgia. His parents, John and Mariam, gave him the name Andria at Baptism. He accompanied King Archil to Russia and helped him to found a Georgian print shop there, but after he returned he was captured by Dagestani robbers and sold into slavery. Through the efforts of Patriarch Dositheus of Jerusalem, Anthimus was finally set free, but he remained in the patriarch’s service in order to further his spiritual education. Already famed for his paintings, engravings, and calligraphy, Anthimus was asked by Prince Constantine Brincoveanu (1688–1714) of Wallachia (present-day Romania) to travel to his kingdom around the year 1691. After he had arrived inWallachia, he began to manage a local print shop. The printing industry in that country advanced tremendously at that time, and the chief inspiration and driving force behind the great advances was the Georgian master Anthimus. He succeeded in making Wallachia a center of Christianity and a major publisher of books for all the East. Under the direct leadership of St. Anthimus, more than twenty churches and monasteries were erected in Wallachia. Of particular significance is All Saints’ Monastery, located in the center of Bucharest. The main gates of this monastery were made of oak and carved with traditional Georgian motifs by St. Anthimus himself. The metropolitan also established rules for the monastery and declared its independence from the Church of Constantinople. His words were prophetic: In 1714 the Turks executed the Wallachian prince Constantine Brincoveanu, and in 1716 they executed Stefan Cantacuzino (1714–1716), the last prince of Wallachia. In his place they appointed the Phanariote (a member of one of the principal Greek families of the Phanar, the Greek quarter of Constantinople, who, as administrators in the civil bureaucracy, exercised great influence in the Ottoman Empire after the Turkish conquest.) Nicholas Mavrokordatos, who concerned himself only with the interests of the Ottoman Empire. Then a council of bishops, which did not include a single Romanian clergyman, condemned the “conspirator and instigator of revolutionary activity” to anathema and excommunication and declared him unworthy to be called a monk. But Nicholas Mavrokordatos was still unsatisfied and claimed that to deny Anthimus the title of Metropolitan of Hungro-Wallachia was insufficient punishment. He ordered Anthimus to be exiled far from Wallachia, to St. Catherine’s Monastery on Mt. Sinai. Metropolitan Anthimus, beloved of the Romanian people, was escorted out of the city at night since the conspirators feared the reaction of the people. But Metropolitan Anthimus never reached Mt. Sinai. On September 14, 1716, a band of Turkish soldiers stabbed St. Anthimus to death on the bank of the Tundzha (Tunca) River where it flows through Adrianople, not far from Gallipoli, and cast his butchered remains into the river.